University in 1984. Darlene earned a Bachelor of Science degree in Finance and Marketing Management. Deborah earned a Bachelor of Science degree in Computer Engineering. Upon graduation, Darlene worked at Merrill Lynch as a Margin Option Specialist until 1989. She relocated to the Washington, DC metropolitan area and continued her employment in the finance industry. Transitioning from commercial finance to campaign finance, she held several positions at the Federal Election Commission, from 1991 until 2010. As a Federal Government career employee, she is currently employed at the Internal Revenue Service. 1992. While at Metropolitan Baptist, they were active participants in the Singles Ministry and volunteers in the vacation Bible School. As current members of the First Baptist Church of Glenarden for over 10 years, they are active in the S.H.A.R.E. ministry and participate in other church-wide community outreach projects. Darlene and Deborah are Golden Life members of Delta Sigma Theta Sorority, Inc. 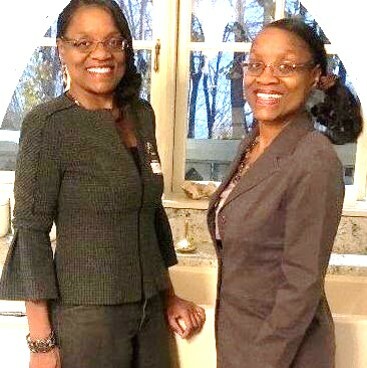 Both were initiated at Syracuse University, Kappa Lambda Chapter – Deborah in March 1982 and Darlene in December 1983. They were members of the Central Jersey Alumnae (CJA) Chapter for 5 years. As residents in the DC metro area, their membership in the sorority has continued in the Federal City Alumnae Chapter (FCAC) in Washington, DC. Darlene also served as a member of the National Ad Hoc Commission for Undergraduate Concerns from 1988 to 1992.
together. As season ticket holders for the Washington Bullets/Wizards since 1991, their most treasured memories have been meeting and developing close friendships with the legends they watched growing up. The most enjoyable sports trips taken are NBA All-Star weekends, playoff games and sports cruises. Other memorable trip locations are Martha’s Vineyard and Europe. Their greatest passion is helping others afford a college education. While serving as mentors in the New Horizons College Club (1984-1989), they guided high school students in their pursuit of a college degree. They donate to the scholarship funds of New Horizons, Calvary Baptist Church, First Baptist Church of Glenarden and Delta Sigma Theta Sorority, Inc. (CJA and FCAC). While attending Syracuse University Coming Back Together reunions (for African American and Latino alumni), they “party with a purpose” – – donating to the Delta Sigma Theta and Syracuse 8 scholarship funds under the Our Time Has Come scholarship umbrella.